Princeton University Press, 9780691180311, 288pp. The theropod dinosaurs ruled the planet for millions of years, with species ranging from the mighty Tyrannosaurus rex to feathered raptors no bigger than turkeys. Dinosaur Facts and Figures is a stunningly illustrated book of records for these marvelous creatures--such as the biggest, the smallest, and the fastest theropods, as well as the ones with the most powerful bite. This one-of-a-kind compendium features more than 3,000 records, covers some 750 theropod species, and includes a wealth of illustrations ranging from diagrams and technical drawings to full-color reconstructions of specimens. 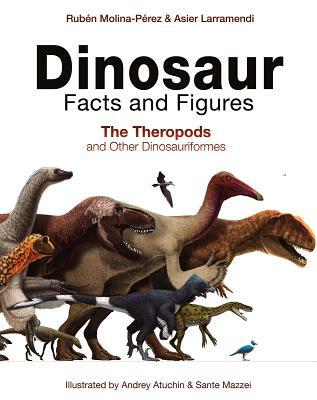 The book is divided into sections that put numerous amazing theropod facts at your fingertips. "Comparing Species" is organized by taxonomic group and gives comparisons of the size of species, how long ago they lived, and when they were discovered. "Mesozoic Calendar" includes spreads showing the positions of the continents at different geological time periods and reconstructions of creatures from each period. "Prehistoric Puzzle" compares bones, teeth, and feathers while "Theropod Life" uses vivid, user-friendly graphics to answer questions such as which dinosaur was the smartest and which had the most powerful bite. Other sections chart theropod distribution on the contemporary world map, provide comprehensive illustrated listings of footprints, compile the physical specifications of all known theropods and Mesozoic birds, and much more.